I've been trying to make a cheesecake for... well, let's just say, too long! Every cheesecake I've made in the past was quite the failure. The first was not cooked all the way through, plus, it wasn't flavorful at all. The second didn't have the proper texture (it was a little too dense) and didn't possess that tangy flavor associated with real cheesecakes. The third not only sunk in the center, it formed a hard surface in the oven! Yeah, I'm pretty much a failure in the kitchen sometimes. But this. This is what I call delicious! It's creamy and smooth, airy, tangy and sweet. A perfect description of the word, "decadent." Unlike the ordinary Cheesecake Factory cheesecake, this cheesecake contains no refined sugar and no eggs (trust me, it works), yet it is still surprisingly rich! Back then, whenever my family and I went to dinner my parents always ordered cheesecake for dessert. I was never a fan of its tangy flavor and super creamy texture, but I'm definitely starting to appreciate the flavor more nowadays. But now that my parents are watching their cholesterol levels, restaurant cheesecake is a no-no. When I gave a bar of my healthified cheesecake to my mom, all she exclaimed was, "Oh my gosh!" and shoved another forkful into her mouth. She even said it tasted like a classic restaurant cheesecake, and I trust her (very) knowledgable critique! This yolkless cheesecake was an answer to their cheesecake-involved prayers. 1. Preheat the oven to 350 degrees Fahrenheit and line a square brownie pan with parchment paper. 2. In a blender, blend the crust ingredients until mixture is sticky enough (to see if it's ready, clump a ball of the mixture between your hands and make a patty. If it's crumbling, blend a little more). Press into the pan and flatten to ensure it's even in all places. Bake for 11 minutes. 1. In a large mixing bowl, whip together the cream cheese and yogurt. 2. Add the arrowroot and whip again. 3. Add the extracts and brown rice syrup and whip again, then finally add the protein powder (make sure there are no clumps!). Pour over the somewhat cooled crust (after I took it out of the oven I put it into the freezer while I made the filling). Bake for 33 minutes, or when cracks form on the crust (yes, cracks are okay in this cheesecake!). Once done baking, let cool a bit, place a paper towel over the cheesecake and put into the fridge overnight. 1. Spray a pancake pan with cooking spray and place over medium heat. 2. Slice the apples into thin slices, coating both sides with lemon juice and sprinkling both sides with cinnamon. Cook on the pan for about 1-2 minutes on each side, or until tender. 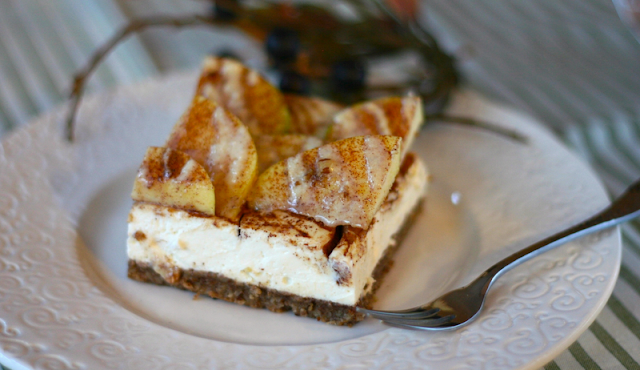 Place onto the cheesecake in the pattern of your choice and sprinkle with more cinnamon if desired. 2. Place mixture into a piping bag (or sandwich bag, and snip a small corner off the bag) and drizzle in the design of your choice. Yum! This looks beautiful! The apples on top are gorgeous, especially with that drizzle over top. I love cheesecake and haven't had it in way too long! Wowza! I'm a sucker for ANY kind of cheesecake but this just looks flat-out amazing! Your photos are beautiful too!